Christmas was great this year as usual and like every year included something Super Hero or Star Wars related. 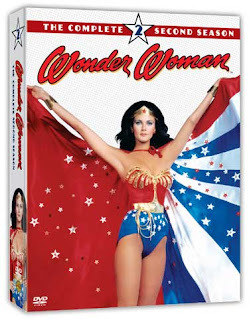 One of my gifts this year was the season two of Wonder Woman TV series on DVD, provided by my wonderful wife. Now some of you comic book fans out there might be saying, "You don't have season 2 of Wonder Woman, yet?" But yes it is true, up until now I only had season one, and really I don't have a definite answer to why that is. I had always intended to buy all three seasons, but just never did. It could be that I just don't really have time to watch them. Another reason maybe that I was more of a fan of the first season of Wonder Woman than the other seasons. I guess I just liked the stories taking place during World War II and don't forget the first season included Debra Winger as Wonder Girl. Over all the packaging for the DVD set is as well done as season one. The cover explains, What's Wonder Woman up to now? Flash Forward 35 Years from her stirring Season-One adventures defending America in World War II. Without missing a beat, Wonder Woman leaps from the big-band era to the disco decade, still miraculously young and still using wits, wiles and astonishing powers to fight evil. Season Two (21 episodes following a feature length season premiere) introduces Wonder Woman to a new America of nuclear power and computers. Teamed with Steve Trevor, son of the dashing major she worked with during World War II. She takes the name Diana Prince and takes on all kinds of danger from terrorists, mad geniuses, crooks and even a diabolical rock star while working for America's Inter-Agency Defense Command. Wonder Woman, we're proud you're on our side. The inside of the boxed set includes a complete episode guide with story synopsis, director, writer and original episode air date. 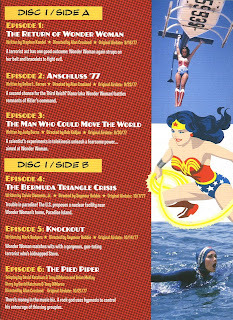 There is even a documentary entitled "Revolutionizing a Classic: From Comic Book to Television, The Evolution of Wonder Woman From Page to Screen." I popped in the DVD Christmas morning and watched the episode "The Deadly Toys", which had references from Christmas in it, but the episode actually aired December 30, 1977. A week after Christmas. This episode also starred Batman alumni Frank Gorshin as a sinister toy maker. This episode also included a Dynasty like cat fight as Wonder Woman battled her robot copy. I need to get season three and complete the collection as truly did watch show the religiously whenever it was on. Whomever gets cast as Wonder Woman, if a Wonder Woman movie ever gets made, is going to have some big boots to fill. Maybe they should just cast Lynda in the new movie. She still looks great.